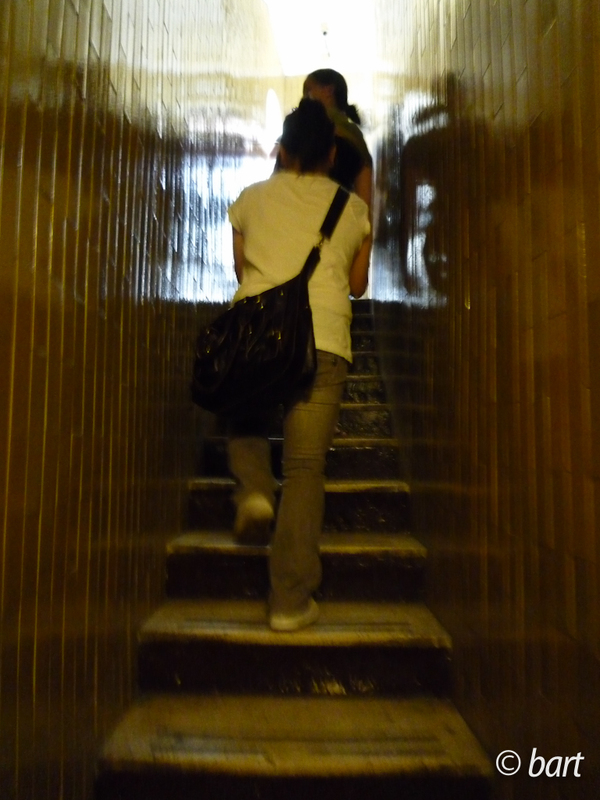 If you’ve read my posts on my Seoul trip, you’re probably familiar with my love/hate relationships with stairs. Now, I’ll have to clarify that and extend it to encompass anything going uphill, be it steps, slopes or…whatever. You get the picture. I’ve never been a gym rat and, up until a few months ago, never maintained a regular exercise schedule. That changed because, aside from the health factor, I’ve realized just how beneficial physical strength and endurance is to traveling. If you get down to the basic nitty-gritty of it, traveling involves a hell of a lot of walking, especially if you really want to explore as much as you can. And more often than not, there’s bound to be that tower, hill or bridge you have to climb to enjoy the view at the top. Trust me when I say that THAT view and that experience will make the round trip more than worthwhile. Here are five of my most epic journeys up (so far), in chronological order. 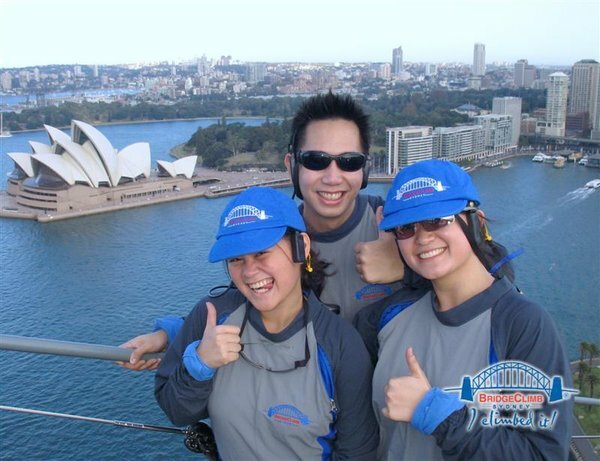 The Bridge Climb is a three and a half hour journey up and down the Sydney Harbour Bridge, one of Australia’s most recognized icons. To reach the summit — a whopping 134 meters above the mean sea level — a climb leader takes you through catwalks and up ladders along the bridge’s outer arch. Of course, you’re equipped with your very own headset to allow you to listen to the commentary of your guide. It’s been more than six years since I did this so I can’t remember all the details. What I do remember is the shaking of my legs as I forced them to step up and up and up while seeing the ever-increasing distance from the ground through the metal slats of the ladders. I would stop every so often to steady myself, and my sister behind me would ask if I was okay. The climbing was okay; it was the height that got to me–or rather, the fact that I could see the space beneath me. The epic factor? 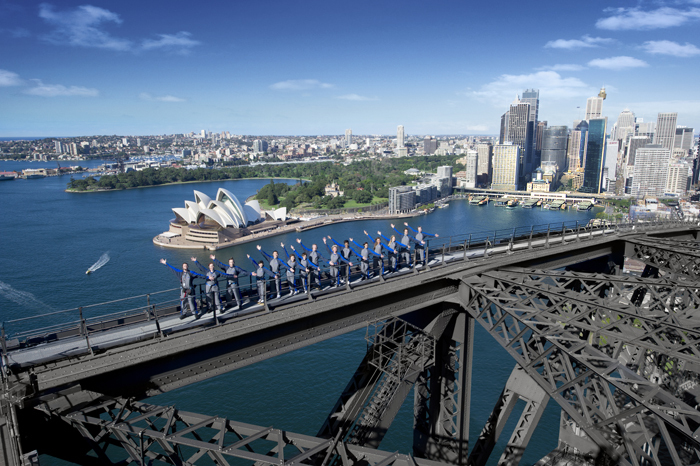 Well, aside from the Harbour Bridge being the largest and widest steel-arch bridge in the world, the view of the cityscape from the summit was stupendous — especially since it featured the Sydney Opera House, definitely one of my favorite architectural wonders. Too bad we weren’t allowed to bring cameras, as you’re supposed to hold on to the rails with both hands. Also an internationally known icon, this time of London, the St. Paul’s Cathedral is one of the churches that I find truly beautiful. 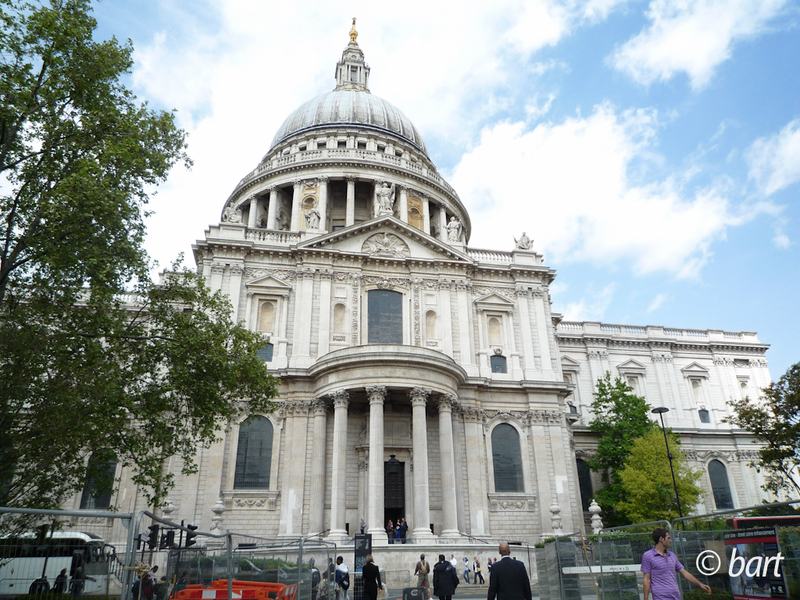 It was designed by the illustrious Sir Christopher Wren in the English Baroque style. It’s ornate, yet dignified; stately without being overwhelming. Built after the sixteenth century’s English Reformation, the cathedral has witnessed royal ceremonies and state funerals alike. 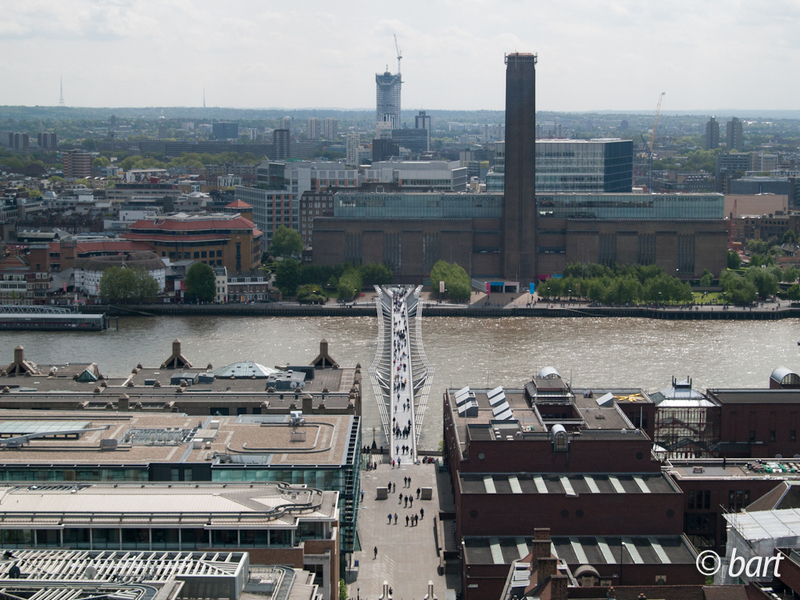 For those reasons, St. Paul’s is one of the automatic must-visit places for tourists. Did you know, though, that it also affords you one heck of a view of the city? Your sightseeing ticket (then priced at 11 pounds, but is now at 15 pounds) admits you not only to the cathedral floor and crypt, but also to the three galleries in its dome. The first gallery, and the only one housed within the dome, is known as the Whispering Gallery. It is named as such because a whisper against its walls can be heard by someone with his ear to the wall on the opposite side (and I do recommend you try it!). 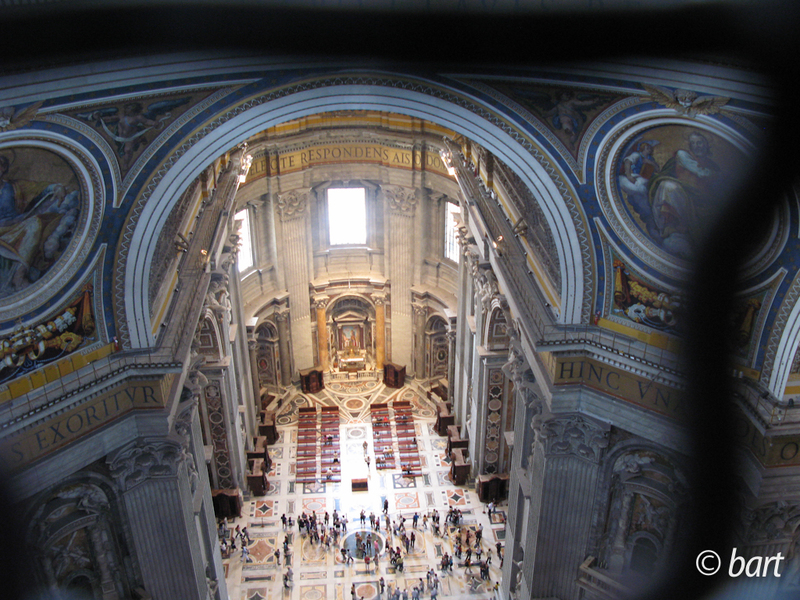 At 259 steps up from the main cathedral floor, the Whispering Gallery gives you both an aerial view of the cavernous main worship area below and a that of the murals and mosaic adorning the inside of the dome. Then it gets rather trickier. To get to the Stone Gallery, running along the outside circumference of the dome, you have to go up 119 steps via the stairway built in between the inner and outer dome shell. It’s a pretty narrow area, with space good for one person at a time — maybe two, if you squeeze in, but why would you? I felt quite claustrophobic, especially with the painted brick wall that brought to my mind the stairway to a gothic dungeon. And did I mention that it’s a spiral stairway, too? Does this even require an introduction? St. Peter’s Basilica is probably the most recognized Catholic Church in the world and is definitely the most awe-inspiring one I’ve been to so far. A prime example of Renaissance architecture, it took more than one architect to design it and more than 120 years to complete it. 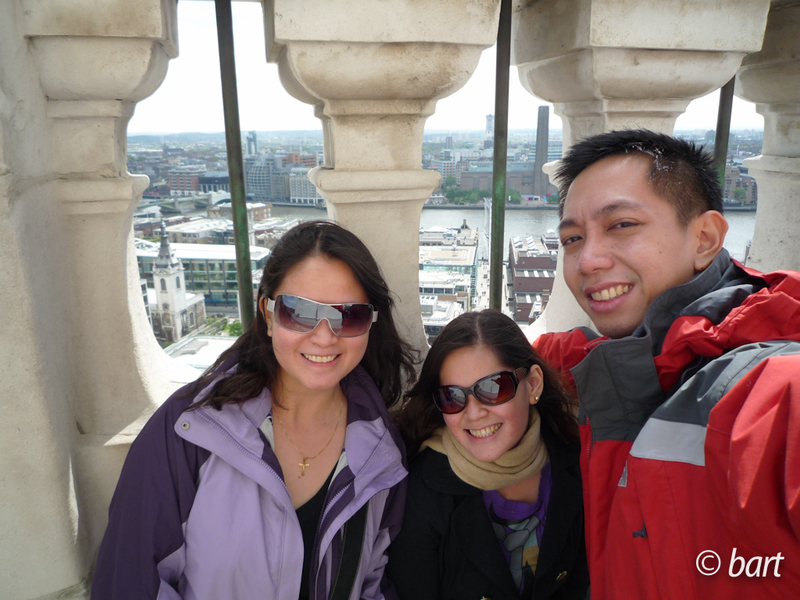 Since we climbed the dome of St. Paul’s, we just had to do the same in the basilica that inspired Sir Christopher Wren’s masterpiece. 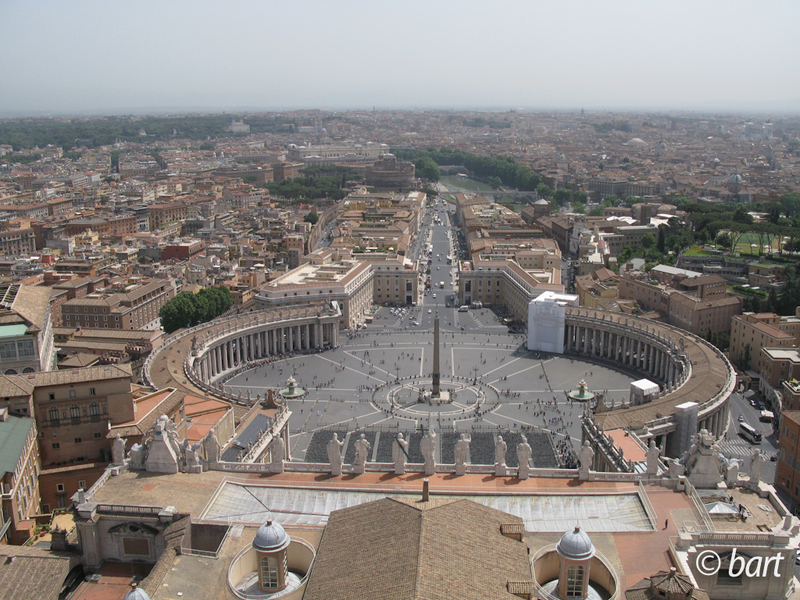 The dome of St. Peter’s is known to be the tallest in the world, making climbing it a daunting task. Thankfully, there’s such a thing as an elevator that’ll bring you up to the base of the dome, cutting your effort down by around 170 steps. At 7 euros, just one euro more than the price when taking the steps all the way, it’s a pretty good deal. 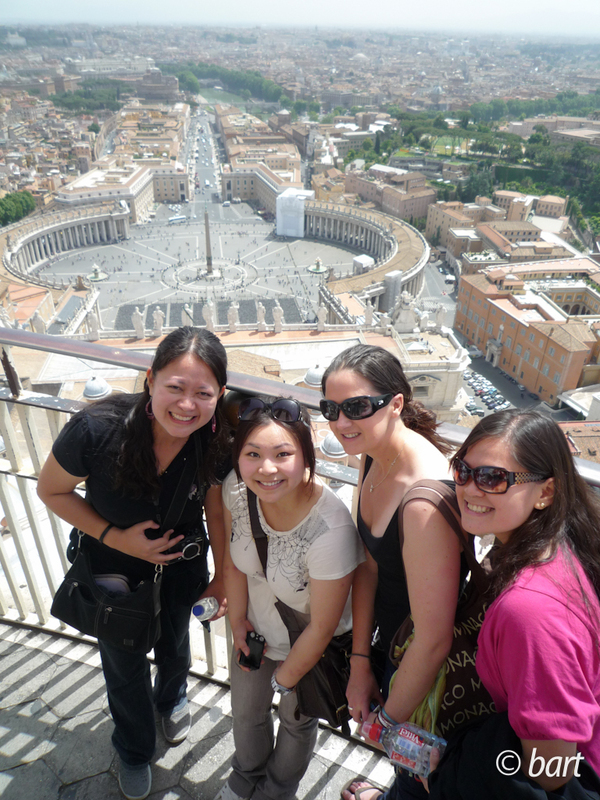 Before taking on the 320 steps to the top, we were welcomed with a beautiful view of both the interior of the basilica below and the detail of the dome above — similar to St. Paul’s Whispering Gallery. Then, it was time to gird our loins and take on the climb. I have to warn you, that dome is not for sissies. You know how I wrote that you could probably squeeze two people in St. Paul’s stairway? Well, that’s definitely not the case here. The stairway is not only narrow, the walls are curved in, too. That means that you’re not exactly standing upright; you’re basically following the curvature of the dome. So it’s going to be tough going should you suddenly decide to turn back. Think hard before you choose to make the climb, and when you do, commit to it. Okay, technically, we took a train up the mountain so there wasn’t too much climbing involved. But hey, it’s the Top of Europe! How EPIC is that? 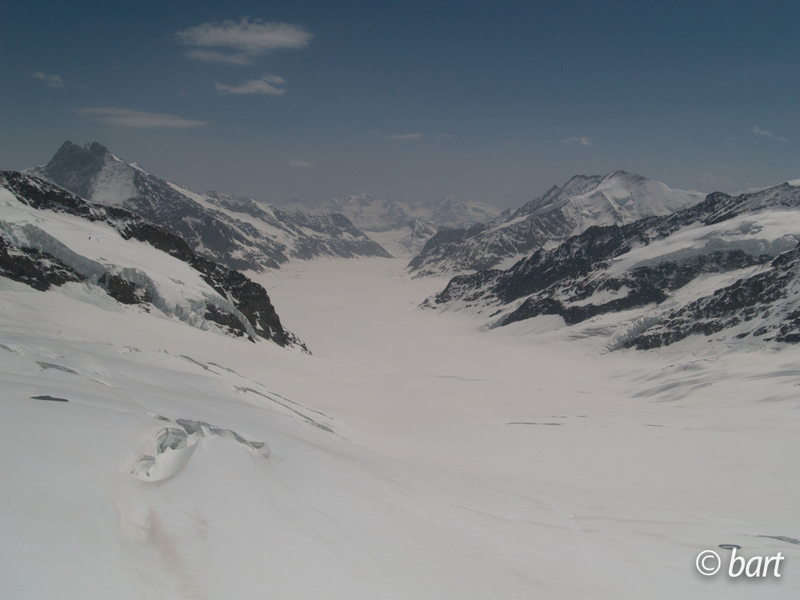 The journey from our camp in Lauterbrunnen to Jungfraujoch was pretty long. We started off with a 15 minute walk uphill to the town train station. From there, we took a coach to Kleine Schleidegg, the starting point of the train to the Top of Europe. 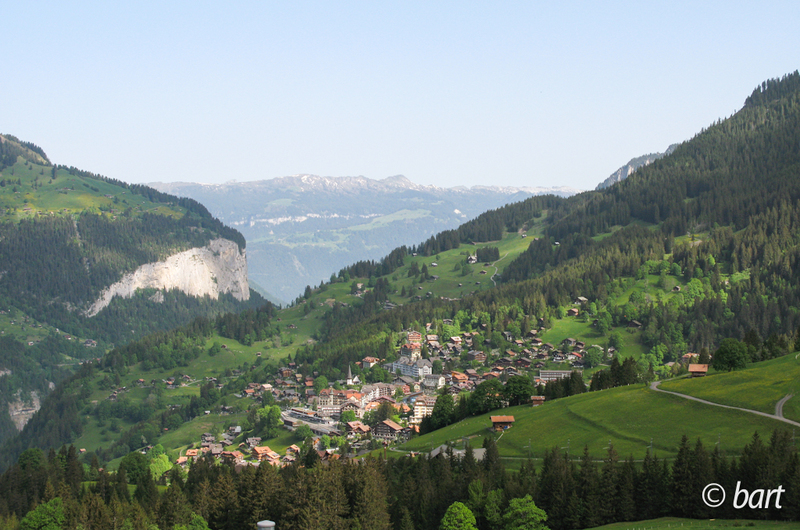 The ride took about an hour, and the view along the way was amazing — I saw the alps from afar, the towns down the hill, and caught glimpses of small streams and glittering waterfalls hidden away in the mountains. 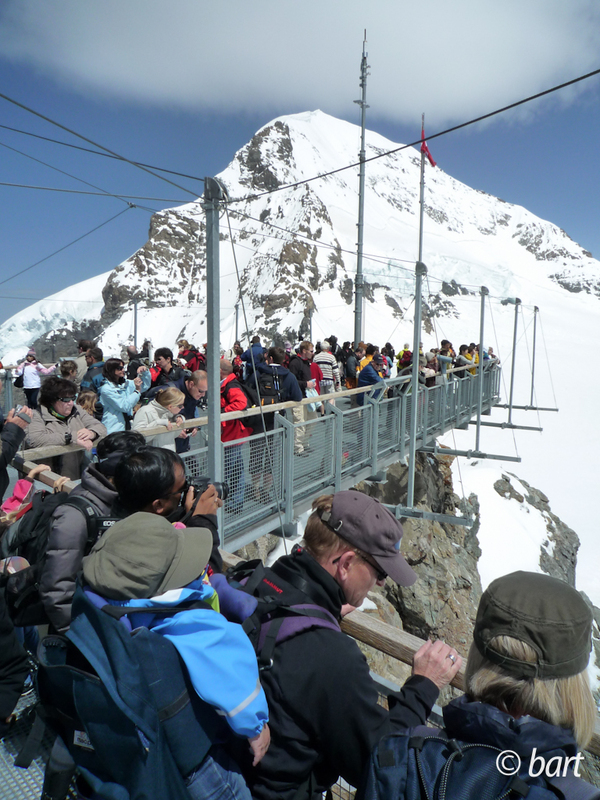 Then it was another 50 minute ride up to Jungfraujoch, which, at 3,454 meters, is Europe’s highest altitude railway station. The first thing I registered upon exiting the train was how cold it was — and it just got colder as we entered the Ice Palace. As the name suggests, it’s made of ice and features ice sculptures of arctic animals such as polar bears, penguins and seals. 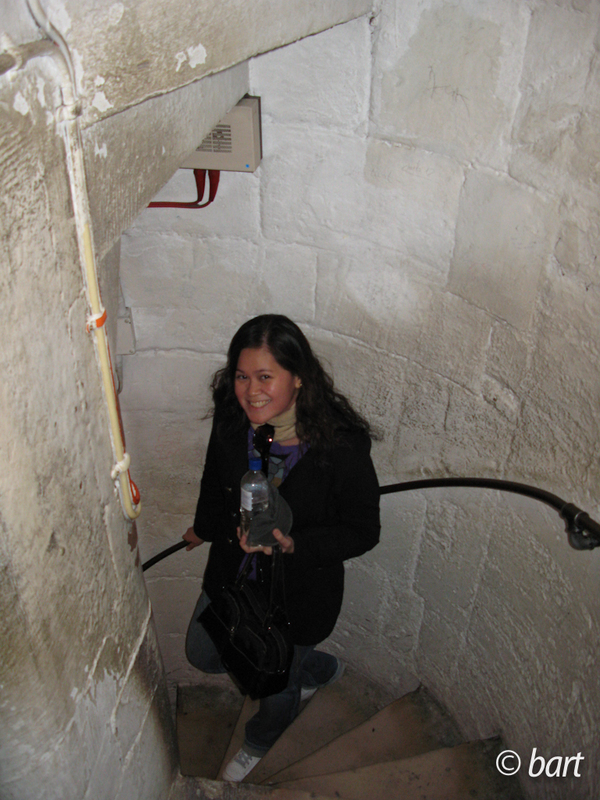 In order to get to the plateau, we had to climb several flights of stairs. I can’t remember how many steps that was, because it was inconsequential once we got there. Having lived in a tropical country all my life, I’d never experienced snow before. It was breathtaking. It was really hard to walk because my shoes kept sinking in the snow. It was really, really cold and the sun was shining so brightly, but I got to throw my first ever snowball and it felt glorious. 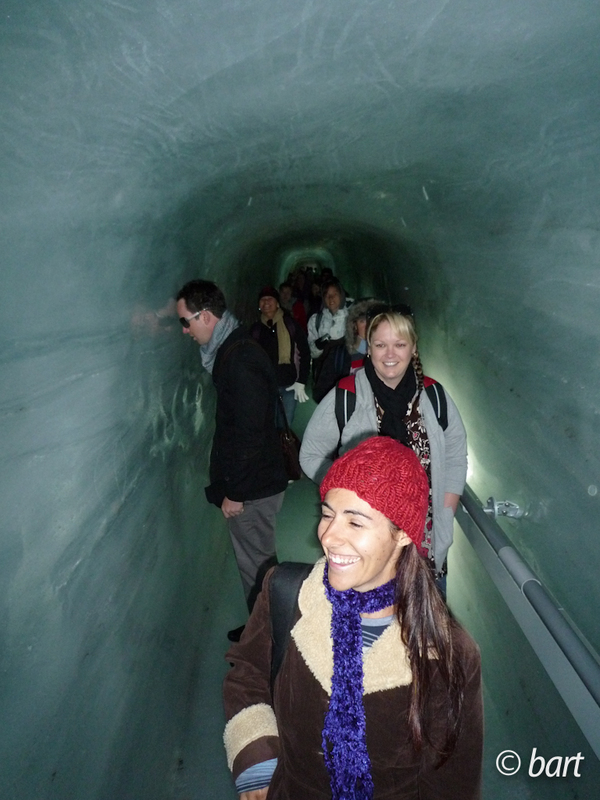 The highlight of Jungfraujoch is the Sphinx. At 3,571 metes above sea level, the Sphinx provides staggering views of the glaciers dominating this winter wonderland. It is said that you can see Italy, France’s Vosges Mountains and Germany’s Black Forest. 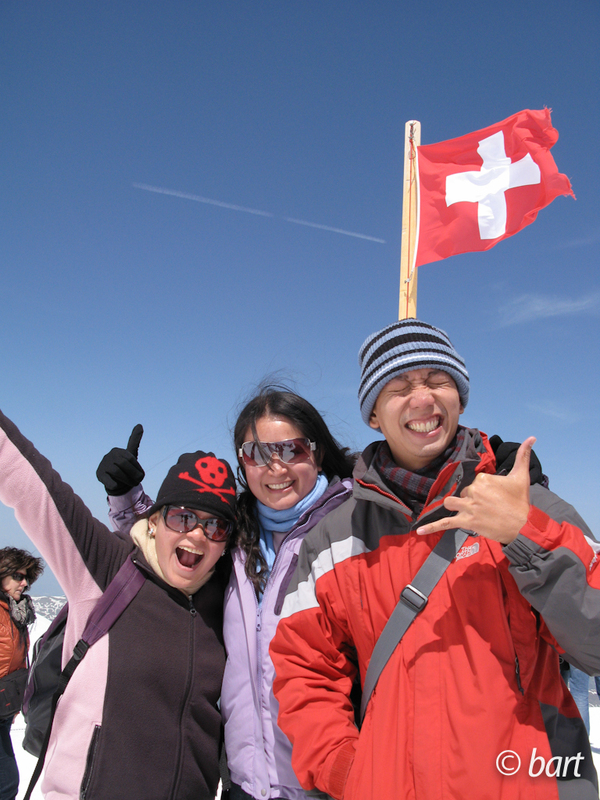 Click here for a quick video of the view from the Top of Europe, and here to learn more about this Swiss Mountain experience. First of all, the photo above is so funny. We look like refugees of some sort, all bundled up with scarves covering our heads. It was so darn cold up in Ngong Ping, and to make matters worse, it rained down on our parade. Let’s rewind, though. 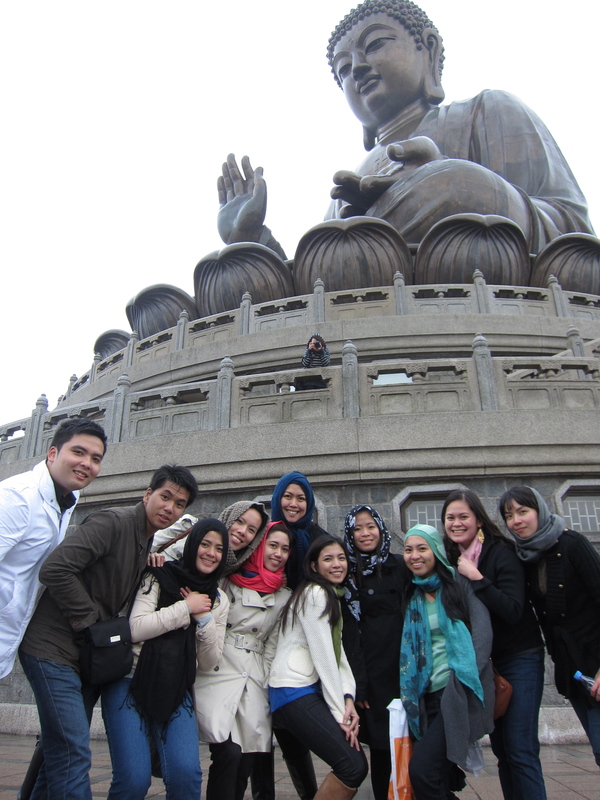 Tian Tan Buddha, affectionately known as the Big Buddha, is a huge bronze statue of a Buddha seated on a lotus throne. Up until 2007, it was known to be the tallest outdoor bronze seated Buddha in the world. 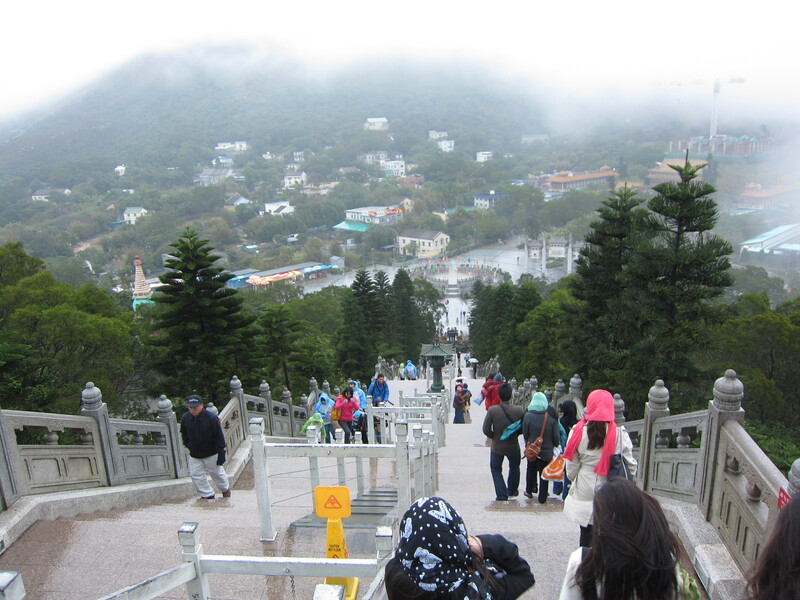 It is located in Ngong Ping, one of the highlands in Lantau Island, and is one of Hong Kong’s major tourist attractions. You can go here via bus or taxi, but my officemates and I decided to go the scenic route. Translation: by cable car. At 125 HKD per adult, you get a round trip ticket from Tung Chung to Ngong Ping via a standard cable car. And if you’re feeling more adventurous and less acrophobic, you can shell out an extra 63 HKD to ride a crystal cabin, which allows you an unobstructed view through its glass floor. When went up, the fog was so thick that it seemed as if we were heading towards the big unknown. After the 25 minute ride, we walked through the Ngong Ping Village, passing by the Po Lin Monastery and statues of warriors along the way. 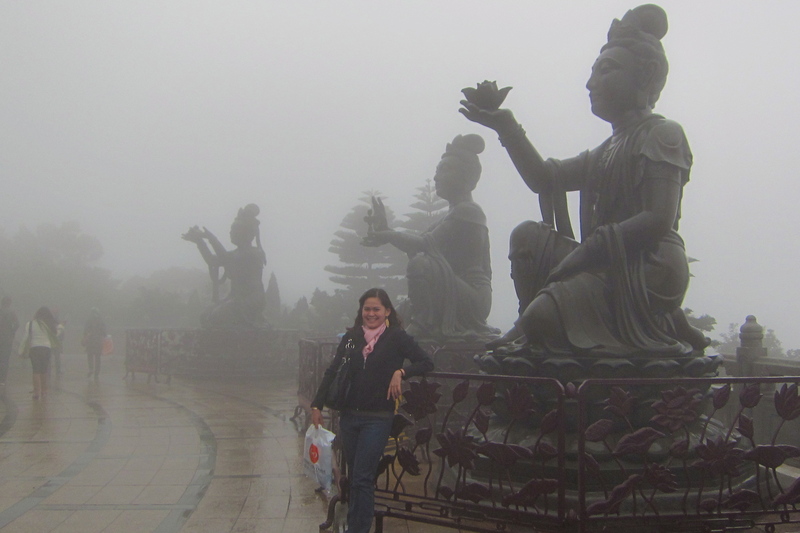 We could already see the Big Buddha from afar — at least, the parts of him that weren’t obscured by the fog. 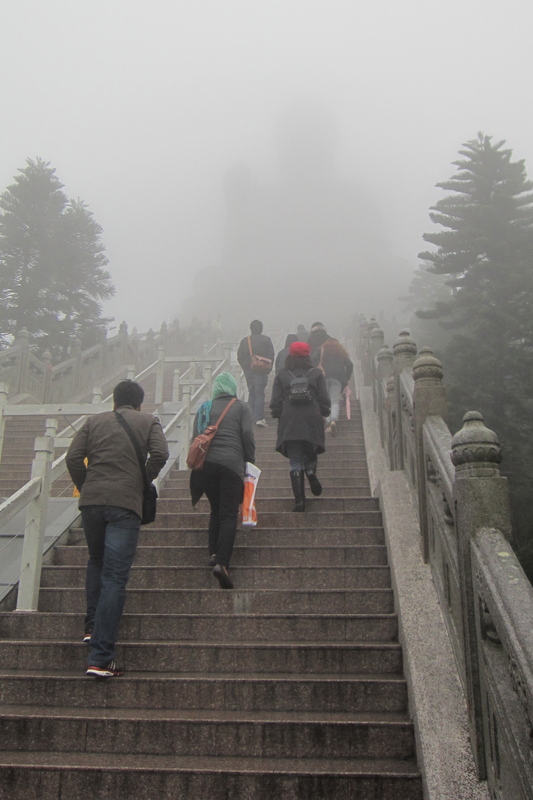 It was the image of Buddha that served as our beacon as we trudged up the 268 steps. And when we got there? Well, let’s just say that the heavens seemed to clear for us.